If you are looking for a challenge that will have a real and positive impact on the environment, both locally and globally, then there is a great opportunity next week. What is Zero Emissions Day? Zero Emissions Day, also known as ‘ZeDay’, is a worldwide movement that aims to encourage the use of renewable energy sources, as opposed to finite fossil fuels. Started in 2008, founder Ken Wallace launched a website calling for September 21st to be a day where no fossil fuels are consumed. Don’t use or burn oil, gas or coal. Minimize (or eliminate) your use of electricity generated by fossil fuels. Don’t put anyone in harm’s way: All essential and emergency services operate normally. Do your best, have fun, enjoy the day! Since the launch of Zero Emissions Day, 10 years ago, the date has become one that has gained global recognition. Why is ZeDay so important to promote? As we all know, the planet’s current fossil fuel consumption is not sustainable in any way, so the global movement created by ZeDay is crucial to raising awareness for action to be taken against the use of fossil fuels. 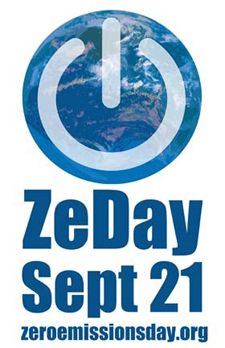 Is there something you can do in your organisation on ZeDay? How about recruiting a group of colleagues to see if you can avoid anything that involves the use of fossil fuels on the 21st of September? You’ll find it an interesting challenge as you discuss what actions you can take individually and collectively. Remember, there are a few ideas, materials and general inspiration on the campaign website – Zero Emissions Day. Actions your organisation can take to reduce emissions every day: take a look at our Sustainability page. If your organisation’s values include improving our environment then reducing your reliance on fossil fuels is just one way to make an impact. In fact, emissions are just one part of a much larger debate on sustainability. If you would like to read more about sustainability and get additional ideas on how your organisation can make a difference, take a look at our three-part sustainability guide. At Westminster City Council Commercial Waste Services we are working every day to minimise emissions possible, all year round. Our collection trucks have a large capacity and produce minimal emissions, meaning that we can collect large amounts of commercial waste before returning to the locally based treatment This avoids the need of unnecessary inefficient round trips when small vehicles are used. Our fleet of vehicles is much newer than many other waste collectors, which also means fewer vehicle emissions per waste collection journey. The majority of our waste is treated at local treatment facilities, eliminating the need for waste to travel outside of London or abroad for disposal or treatment. We are working with a number of London BID (Business Improvement District) Areas to reduce the number of waste vehicles travelling through their members’ neighbourhoods, so reducing emissions further. As a waste collection authority, we have a legal obligation to pick up waste in every street of Westminster. While we’re travelling through, it makes sense to collect as much waste as possible at the same time regardless of whether this comes from households, businesses or the street cleansing operation. By doing this, we can eliminate the need for any other waste collection trucks producing harmful emissions to be travelling through your street. Additional vehicles also result in unnecessary congestion and vehicle idling in Westminster – all of which increases the level of traffic emissions. If you’d like to support the reduction of emissions then why not make a big contribution to your local area by switching to your most local commercial waste services operator – Westminster City Council.